Dedicated to share our passion and excitement for food, we frequently change our menu depending on seasonal products and the favorite tastes of our guests. On average our dinner menu changes every other day, the lunch menu even daily. Nature offers too many fascinating flavors to restrain the art of cooking only to one style or region. Therefore we do not only cook Mediterranean, Asian or local dishes; we endeavor to refine fresh products with aromas from around the world and present a truly fusion taste on your plate. And that is what we call “Modern European Cuisine”. A real highlight is our new Flywheel-slicer. 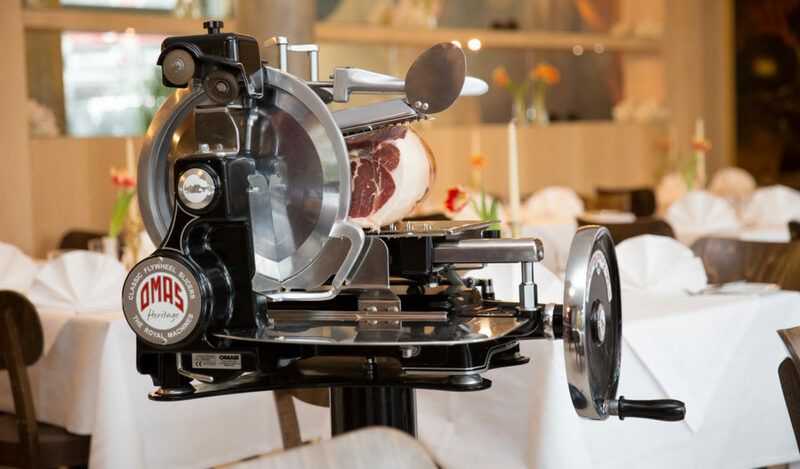 A low rotation-per-minute blade makes all the difference when it comes to cutting fine smoked ham. The razor-thin cuts leave the fat inside the ham unharmed. In this way delicatessen such as a 36-month aged Parma ham, an intense Gran Reserva Serrano or a 48-month aged Coppa de Cabecero Iberica de Bellate can evolute the whole spectrum of their flavors.